What Is Depreciation? and How Do You Calculate It? Depreciation isn’t a nice word. It sounds like the opposite of “appreciate” which is weird because you’ll probably appreciate all the tax savings it will give you! Even if you defer all things depreciation to your accountant, brush up on the basics and make sure you’re leveraging depreciation to the max. Depreciation lets you deduct the cost of something you bought for your business. But instead of doing it all in one tax year, you write off parts of it over time. When you depreciate assets, you can plan how much money is written off each year, giving you more control over your finances. The number of years over which you depreciate something is determined by its useful life (e.g. a laptop is useful for about five years). Different assets are sorted into different classes, and each class has its own useful life. An asset is anything with a dollar value. The IRS also refers to assets as “property.” It can either be tangible, or intangible. A tangible asset can be touched. Think office building, delivery truck, or computer. An intangible asset can’t be touched—but it can still be bought or sold. Examples include a patent, copyright, or other intellectual property. Both tangible and intangible assets can be depreciated. In the case of intangible assets, the act of depreciation is called amortization. What kind of assets can you depreciate? To depreciate an asset on your tax return, you need to file IRS Form 4562. Our guide to Form 4562 gives you everything you need to handle the process smoothly. The useful life of an asset is how long it will help your business before you send it to the junkyard. The IRS uses a system called the Modified Accelerated Cost Recovery System (MACRS) partly to set the useful life for different types of assets. The information is arranged into tables, which you can find in IRS Publication 946, Appendix B.
There’s more than one way to depreciate an asset. The one you choose will determine how much you write off each year. You may have noticed those names do absolutely nothing to explain how each type works. Don’t worry—the names make sense once you understand the method. Straight line depreciation splits an asset’s value evenly over multiple years. The double-declining balance method and sum-of-the-year’s-digits (SYD) method both let you write off more of an asset’s value in the days immediately after you buy it, and less later on. With the units of production method, the amount you write off each year depends on how frequently the asset is used. An offset printer, a pizza oven, and a sewing machine are all examples of assets you might depreciate with the units of production method. *For the units of production method, instead of a useful life, you need to know how many units the asset can produce (or how many hours it can run for) during its lifetime. What it is: The simplest, most straightforward way (pun intended) to depreciate an asset, writing off the same amount of expense each year. You depreciate the same amount each year of the useful life of the asset. Who it’s for: Small businesses with simple accounting systems, that may not have an accountant or tax advisor to handle their taxes for them. 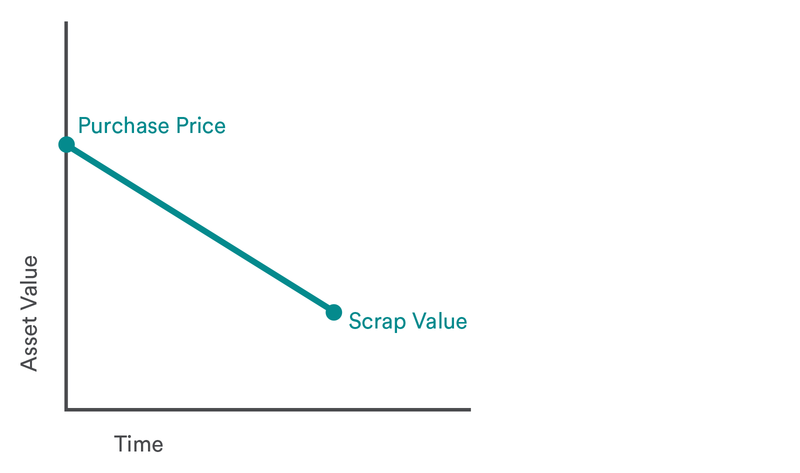 How it works: You divide the cost of an asset, minus its salvage value, over its useful life. That determines how much you pay each year. Your party business buys a bouncy castle for $10,000. Its salvage value is $500, and the asset has a useful life (useful life) of 10 years. So, you’ll write off $1,050 from the bouncy castle’s value each year for 10 years. What it is: A slightly more complicated way to depreciate an asset, allowing you to write off more of its value right after you buy it, and less as time goes on. Who it’s for: Businesses that want to recover more of an asset’s value upfront. This is useful if you’ve just opened a shop, and you have a lot of expenses in your first year—any extra cash helps. How it works: For this approach, you’ll need to do single line depreciation calculations first. That will let you know your depreciation rate (the percentage of the asset depreciates each year). In this formula, we don’t use “(asset cost + salvage value)”. Instead we use “book value.” Book value is “(asset cost + salvage value)”, but taking into account how much of that amount you’ve already written off. If you write off some of the book value the first year after buying an asset, the book value is lower the second year. If that sounds complicated, don’t worry—it’s clearer in the example below. Also, with double-declining depreciation, salvage value isn’t taken into account—just the amount you paid for the asset ($10,000, in this example). Using the formula, you double the asset’s straight line depreciation rate, and multiply it by its book value at the beginning of the year. We’ll use the bouncy castle example for straight line depreciation above. Since the asset is depreciated over 10 years, its straight line depreciation rate is 10%. Keep in mind that the book value will change each year, as money is deducted. You write off $2,000 of the bouncy castle’s value for year one. Keep in mind, though, that you deduct that $2,000 from the book value. That means, going into next year, the book value is $8,000. So, even though you wrote off $2,000 in the first year, by the second year, you write off $1,600. If you continue like this, by the final year of depreciation, you’ll be writing off just $282. 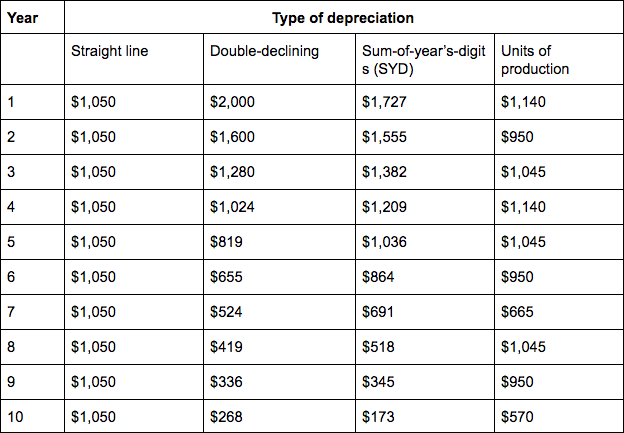 To get a better sense of how this type of depreciation works, you can play around with this double-declining calculator. What it is: A type of accelerated depreciation similar to double-declining. But instead of decreasing the book value, SYD takes away from the remaining life of the asset each year. Who it’s for: Businesses that want to recover more of an asset’s value upfront—but with slightly more even distribution than with the double-declining method. How it works: The SYD is what you get when you add all the digits in a value together. For instance, the SYD for a value of 5 is 15: 1+2+3+4+5 = 15. You divide the asset’s remaining lifespan by the SYD, then multiply the number by the cost, to get your write-off for the year. One important difference with the double-declining method: when using SYD, rather than adding the salvage cost to the asset value and depreciating that amount over time, you take it away. We’ll stick with the bouncy castle example. It cost $10,000, has a salvage value of $500, and will depreciate over a 10 year useful life. So, for your first year, you’ll write off $1,727. This approach rounds the decimal for 10/55. For the most accurate results, use a calculator that lets you multiply fractions. In your last year of depreciation, you’ll write off $173. Play around with this SYD calculator to get a better sense of how it works. What it is: A simple way to depreciate the value of equipment based on how much work it does. “Unit of production” can refer either to something the equipment creates—like pizzas—or to the hours it’s in service. Who it’s for: Small businesses writing off equipment with a quantifiable, widely accepted output during its lifespan (eg. based on the manufacturer’s specifications). You should have systems set up to track the use of the equipment, and be comfortable writing off a different amount each year. How it works: Using the formula above, you figure out the dollar value, in depreciation, for each unit produced. By adding up all the units produced in one year, you get the amount to write off. Once all the units have been written off, depreciation of the asset is complete—its useful life is technically over, and you can’t write off any more units. Since hours of use can count as units, let’s stick with the bouncy castle. Let’s say that, according to the manufacturer, the bouncy castle can be used a total of 100,000 hours before its useful life is over. To get the depreciation cost of each hour, we divide the book value over the total life of the asset. We can write off $1,140 for your first year. That number will change each year. Remember, you can write off a total of $9,500, or 100,000 hours. Learn more about this method with the units of production depreciation calculator. So you can get a sense of the depreciation rates for each method, and how they compare, let’s use the bouncy castle and create a 10-year depreciation schedule. It’s a $10,000 bouncy castle, with a $500 salvage value. Recovery period is 10 years. Total hours of use for lifespan is 100,000. For the sake of this example, the number of hours used each year under the units of production method is randomized. If your business makes money from rental property, there’s a few factors you need to take into account before depreciating its value. You are allowed to depreciate the value of a building you’ve purchased—but the value of the land it’s on can’t be written off. The best way to determine the value of the property, minus land, is to separate the fair market value of each. Then, you just write off the value of the building. Alternatively, you can base the depreciation on how much you paid for the property. To do this, determine a percentage of the cost that went towards the land, and a percentage that went towards the building. Looking at your real estate tax value can help you figure this out. For instance, let’s say the assessed real estate tax value for all your property is $100,000. The value for the house is $75,000, and the value for the land is $25,000. So, 75% of your property’s value is the house. However, you paid a little more than the assessed value—$120,000, in fact. Calculate 75% of $120,000—you get $90,000. That’s the total depreciable value for the house. Certain fees that apply when you buy property get lumped in with the total cost, and can be expensed in the year it occurs. It’s a good idea to consult with your accountant before you decide which fees to lump together with the cost of your property. In between the time you take ownership of a rental property and the time you start renting it out, you may make upgrades. Some of them can be added to the depreciable value of the property. Those include features expected to last longer than a year after rental—like a new furnace, new windows, or new flooring. Also included are repairs you make to damaged property. And if you bring utility services—sewer or electric hookups—to the property, that can also be written off. Section 1250 is only relevant if you depreciate the value of a rental property using an accelerated method, and then sell the property at a profit. Strategic house-flippers could use this method to buy property, quickly write off a portion of it, and then sell it for profit—without giving the IRS their fair share. That’s what Section 1250 protects against. So, if you use an accelerated method, then sell to gain a profit, the IRS makes an adjustment. They take the amount you’ve written off using the accelerated method, compare it to the straight line method, and treat the difference as taxable income. Meaning, it gets added to your tax bill for the year. Bottom line—if you’re buying rental property, and you plan on selling it before you fully write it off your taxes, you may be better off depreciating it using the straight line method. But every situation differs—so talk to a tax advisor or accountant before making any big decisions. It’s smart to understand every type of depreciation, so you can choose the right one for your business. That being said, straight-line is a very popular type for small business—mostly because of its simplicity. Take a deeper dive with Straight Line Depreciation: A Simple Introduction.